Ladle cranes are designed to be operated efficiently, uninterruptedly and safely in continuous use. The design conforms to the requirements of international standards. 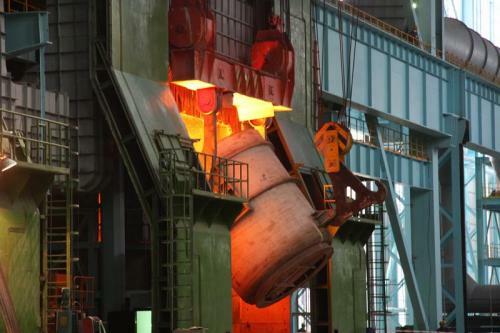 Because of a higher risk level, special safety features are designed for the ladle cranes that transport molten metal. The main hoist mechanism includes four independent rope reevings, double service brakes on primary shafts, and backup brake acting on the rope drum. Rope equalizer beams are provided with a dampening unit to slow down equalizer beam tilting in case of wire rope failure. An upper emergency stop limit switch is also used in the main hoist. In addition to this overload protection, the ‘emergency stop’ system bypassed from PLC, derailment supports, main hoist overspeed supervision, and end limit switches are automatically standard features of the equipment. All main machineries and certain critical functions have built-in operational redundancy to continue at least limited crane operation and help to avoid dangerous situations. Advanced automation function options enable improving safety but also lead to better productivity. Such options are DynAPilot, Sway Control, AutOPilot End Positioning, the AutOPilot Protected Areas system, and the PLC controlled hooking function. All parts of the mechanical and electrical equipment are designed so that they are easily accessible from permanent service platforms for adjustment, lubrication, inspection, maintenance and repair. Emphasis is placed upon quick replacement of faulty or worn parts as opposed to repair. Improved crane reliability and availability can be reached with extensive real-time measurement and diagnostics data. The most sophisticated version of the diagnostic tool (optional) provides clear reports for analyzing the use and productivity of the crane.